AdminStudio 2015 ZENworks Edition is a customized version of Flexera Software AdminStudio 2015 Standard Edition that integrates with ZENworks to help you create, manage, and distribute Windows software bundles. You receive a license for AdminStudio ZENworks Edition when you purchase ZENworks Configuration Management. Capture legacy software installations and repackage them as Windows Installer (.msi) packages. Customize Windows Installer packages. Edit packages to add, modify, or remove files, registry entries, shortcuts, and directories. Add custom actions to run VB scripts or search for prerequisites. Perform advanced configuration such as setting lock permissions and environment variables, editing XML files, and creating upgrades or patches. Create transforms to customize Windows Installer packages, including limiting the features installed, adding custom files to the package, and setting property values. Publish Windows Installer packages as Windows bundles to the ZENworks system. You can then use ZENworks Control Center to manage the bundles and distribute them to devices. 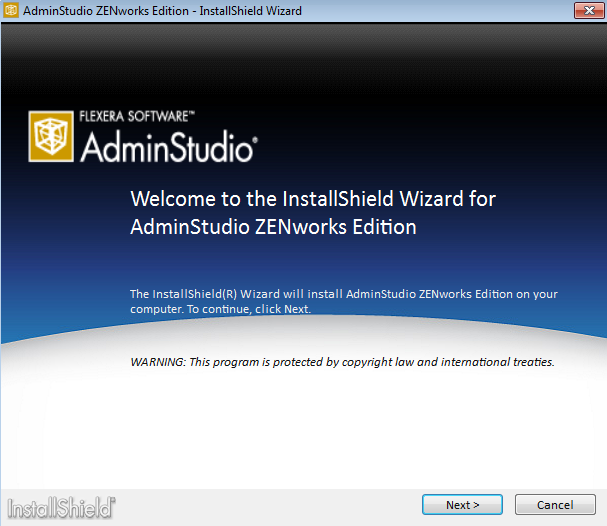 Refer to the remaining sections in this document to install, activate, and begin using AdminStudio ZENworks Edition. Note: Windows Vista is no longer supported. Launch the AdminStudio2015ZE.exe file to extract the installation files and display the Welcome screen. Note: If you are updating from a previous version of AdminStudio ZEnworks Edition, the Welcome screen indicates that a previous version is installed and will be updated. 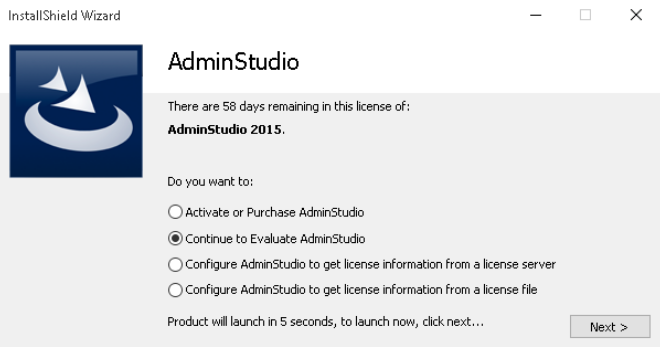 Click Next and follow the prompts to install AdminStudio ZENworks Edition. When installation is complete, click Finish to exit the installation program. Continue with the next section, Activating AdminStudio ZENworks Edition. Click the Start menu > All Programs > AdminStudio > AdminStudio 2015 to launch AdminStudio and display the AdminStudio dialog box. 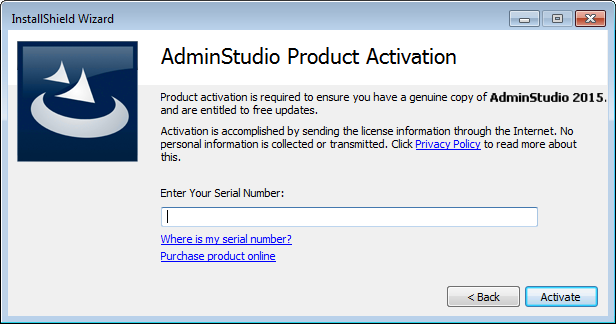 Select Activate or Purchase AdminStudio, then click Next to display the AdminStudio Product Activation dialog box. Enter your license key, then click Activate. Note: If you are updating from a previous version of AdminStudio, you must enter your new AdminStudio 2015 ZENworks Edition license key. 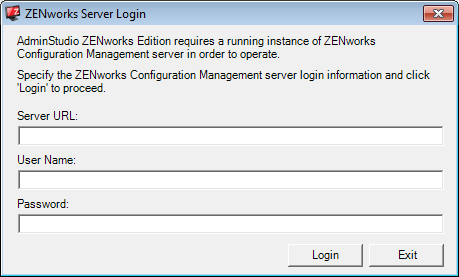 When activation is complete, click Finish to open AdminStudio ZENworks Edition and display the ZENworks Server Login dialog box. Fill in the following information to connect to a ZENworks Primary Server, then click Login. User Name: The name of a ZENworks administrator defined in the ZENworks system. Password: The password of the ZENworks administrator identified in the User Name field. After AdminStudio authenticates to the ZENworks Primary Server, the Getting Started screen is displayed. Continue with the next section, Getting Started with AdminStudio ZENworks Edition. AdminStudio ZENworks Edition activates only the AdminStudio features that are required to create and modify Windows Installer (.msi) packages for use in ZENworks. All other AdminStudio features, while still shown in the interface, are disabled. To access the AdminStudio ZENworks Edition features, click the tab to display the Tools page. 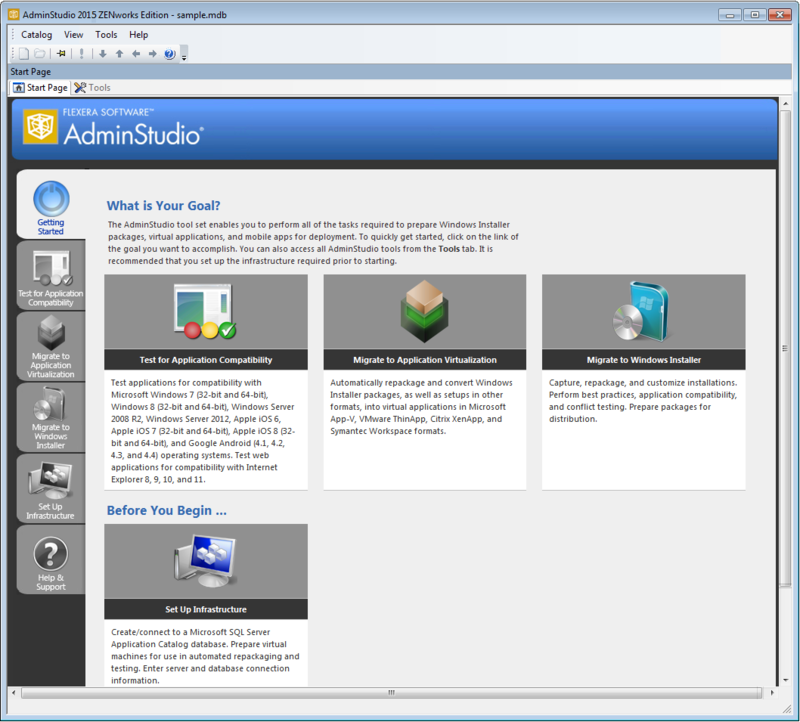 By default, an overview of all AdminStudio tools is displayed. 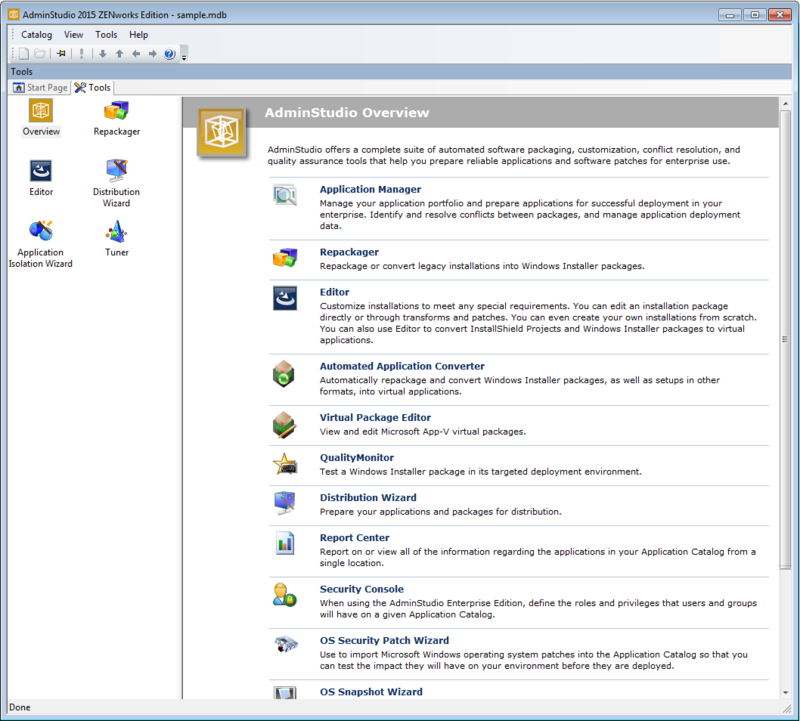 The left navigation pane includes icons for the five tools (Repackager, Editor, Distribution Wizard, Application Isolation Wizard, and Tuner) available in AdminStudio ZENworks Edition. Click a tool (Repackager, Editor, Distribution Wizard, Application Isolation Wizard, or Tuner) to see an explanation of what the tool does. Double-click a tool to launch it. If necessary, refer to the tool’s Help for information about how to use the tool. Software Updates: AdminStudio ZENworks Edition updates are distributed by Novell. Neither the AdminStudio 2015 Software Manager nor the InstallShield 2015 Software Manager provided by Flexera Software is used to update the AdminStudio software. Return License: Do not use the software’s Return License feature (Help menu > About AdminStudio > Return License). The online return process fails and the offline return process makes the software inaccessible. Support: Support is provided by Novell Technical Services. For information about legal notices, trademarks, disclaimers, warranties, export and other use restrictions, U.S.
Government rights, patent policy, and FIPS compliance, see https://www.novell.com/company/legal/. Copyright © 2016 Micro Focus Software Inc. All Rights Reserved.